You don’t need Freedom of Information to expose a politician as a hypocrite. 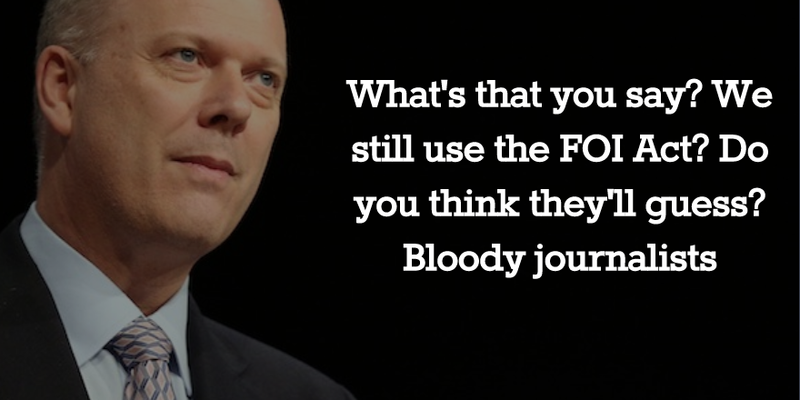 The Daily Mail proved that when it took a matter of hours to call out Chris Grayling after he attempted to ‘shame’ the media for using FOI to get stories! Grayling, it turns out, was a serial user of FOI when in opposition, using FOI for perhaps the grubbiest purpose of all: Not to get information into the public domain, but to throw bricks at Labour. But who am I to call into question the motives that lie behind an FOI request? Exactly – no-one. Motive shouldn’t matter when it comes to FOI, it’s just about the right of any member of the public to ask any question of authority and having a reasonable expectation that they’ll get an answer. But while the Tories in Westminster may loathe FOI as they continue to plot their stitch-up to effectively close the Act down, it continues to be a very useful tool to Conservative campaigners elsewhere in the country. Take the Welsh Tories for example. A quick search of the Conservatives Wales website shows as recently as last month the Tories were pushing FOI-based stories at the Press, such as their outrage at NHS redundancy payouts. They also had no qualms providing attention-grabbing quotes to WalesOnline to support an FOI-based story on redundancies pay outs in councils – the irony of the Tories locally blaming councils for cuts foisted on them by a Conservative government clearly lost on them. Meanwhile in Scotland, the Scottish Tories remain huge fans of FOI – although it’s worth noting the current review in Westminster wouldn’t impact the FOI Act in Scotland. Only last week, the Tartan Tories used FOI to claim the gulf in educational attainment between children from wealthy families and children from poorer families was now wider than ever. And to reveal the number of homes 999 crews won’t visit. It doesn’t take long to find many more. So while it’s clear the Tories at the top in Westminster loathe FOI, there are many within the party who continue to make the most of it. Which rather begs the question: Who is driving the plan to axe the act? COUNCIL workers are being trained to watch neighbour’s bins for signs of terrorism. Glasgow City Council has devised a training course to help employees recognise terrorist threats. It provides a list of “odd things” which the council say are suspicious, encouraging hawk-eyed neighbours to report them to police. Among the list of suspicious activities are “bins with suspicious or unusual items”, as well as bins which are “deliberately avoiding contact”, meaning they are not put out as normal. Two students have been interviewed by Staffordshire University officials in relation to hate speech, a Freedom of Information request by StaffsLive reveals. Of those, one student chose to make a complaint to the university regarding the questioning by officials. A KNUCKLE DUSTER, a vial of morphine, gas and air, blue lights and radio sets are among the items which have been stolen from 999 vehicles over the last five years. The information released to the Mail as part of a Freedom of Information request revealed the huge variety of items stolen from police cars and ambulances since 2010. Twenty-eight people have been murdered at the hands of gunmen in the West Midlands in the past 10 years. The figures were released under the Freedom of Information Act. Last year, there was not a single gun murder. But just last week a man died after a shooting in Birmingham. The years 2005 and 2008 were the worst, with six recorded murders in each year. Calls are being made for more help to be provided to victims of honour based crimes after figures revealed that Newham has the second highest number of reported incidents in the capital. MORE than 1,000 bins have been swallowed up by refuse lorries in the North-east, the Evening Express can reveal today. The containers were tipped into trucks during collections. Hundreds more have been damaged during lifting and emptying, which is carried out by machinery. Council chiefs put the cost of replacing them at tens of thousands of pounds. THOUSANDS of calls to Humberside Police’s 101 number are going unanswered every month, the Mail can reveal. The problem reached its peak in June this year, when about one in three calls to the non-emergency number – 11,335 in total – were abandoned. Although improvements have since been made, 4,521 calls went unanswered in September. Reading Borough Council has handed out more than 600 fines to parents who have allowed their children to miss school over the last three years. A total of 610 fixed penalty notices have been issued by the council for unauthorised absences since the 2012/13 academic year began. Some 210 fines were handed out in 2012/13, while 207 were issued in 2013/14 and 187 were issued in 2014/15. The council has also given out six fines since the current academic year began in September.